When beloved in-laws Buddy and Jeannie Creel called in February to say they were taking a cruise out of Galveston and invited us along with in-laws Don and Beth Trumps, the idea of another cruise after our last December cruise was the farthest thing from our minds. However, the prospect of spending some time with our old Casper relatives and Don and Beth was too much to resist, so we quickly agreed and in short order booked the Carnival Magic out of Galveston for the week of April 26-May 3, sailing to Key West, Florida, and the Bahamas. After looking over the ship’s floor plan, we opted to go up a few levels to Level 12 and pay a little extra to get private spa privileges, also. As our travel agent told us, “The private spa is worth it if you use it but wasted money if you don’t.” We planned to get our money’s worth. So we waited for April 26, 2015. Sunday, April 26. We had planned to drive to Galveston this morning, but with our regular Sunday School teachers, Brother and Sister Boothe, being absent and with my mother-in-law teaching the lesson, we decided to stay for just the SS class anyway and do our musical part and then leave shortly thereafter for Galveston. We did so, and quickly headed home to change clothes and head south. We had packed on Saturday, so we were ready to go once we left church. We left home about 11:20 and had smooth sailing until we got around Clear Lake on Interstate 45 where the traffic bogged down. We were down to a crawl for about five or six miles when it suddenly cleared again and we cruised on into Galveston, down Harborside Drive to Terminal A where the Carnival Magic was docked. The first impression upon seeing these cruise ships is their immense size. The Magic is 1,004 feel long, displacing 130,000 tons…bigger than any battleship in World War II. Fourteen levels consisting of staterooms, restaurants, party rooms, theaters, gambling dens, and every other imaginable vice and joy the human mind can imagine to place on board a seagoing ship. The usual procedure is to drop off your luggage at the terminal, drive to the parking area to park one’s car, then catch a shuttle back to the ship to board. Naturally, since there are 5,000 travelers boarding the ship at approximately the same time, the traffic bogs down around the terminal and things are a little hectic. This is where I nearly suffered my first heart attack. As we neared the terminal to check our baggage, Shirley mentioned casually that she would like to find a bathroom (should have been a red flag for me right there.) Upon pulling up to the baggage check in, I got out, walked around to the rear of the car, got our three bags out, and checked them with the baggage handlers. I started to get back in the car, and saw Shirley as she walked away and disappeared around a wall. The baggage handler even hollered, “Hey, Lady!” but she was gone. I suspected she was looking for a restroom, but she had said nothing. (There is some…um…discussion here…she says she told me she was going looking for a restroom.) I shut off the car and got out, trying to catch a glimpse of her. I suspected there wasn’t a restroom within a thousand feet, mainly because it was a baggage loading area and not meant for public use. So I impatiently waited….10 minutes….15 minutes…then 20 minutes. With each passing minute I could imagine her being in a corner somewhere having been robbed, or she had experienced her first Alzheimer attack and had become disoriented and lost. I tried calling her, and she never answered. I was becoming very frustrated and tried to pray at the same time, which is a hard combination. Finally….finally my phone rang and she said, “Where are you?” She had discovered Buddy and Jeannie and was visiting with them! I was relieved and more than a little upset at the same time, which is another couple of emotions that are hard to combine. Somehow she thought I was going to park the car and then come back for her, but that’s not the way it’s usually done because where we board is not the same place as where we drop off the luggage. Anyway, I was too relieved to feel anything else, so we drove finally to the parking area and abandoned our car for a week. Even that took a while, because, after all, there are 5,000 people boarding the boat, most of whom drove their vehicles to the terminal, so we’re all parking and trying to catch a shuttle at the same time; hence the trip back to the terminal took about 40 minutes. The official check in then begins, with a showing of one’s boarding pass and health statement which confirms that one is not an Ebola carrier. Security is next, with a flashing and confirming of one’s government photo identification (passport) and a trip through a metal detector along with a baggage check. 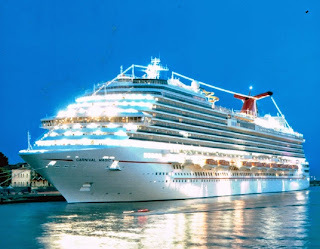 Assuming one is not a terrorist carrying explosives, the next step is up the escalator to Carnival’s check in, where we received our room keys and official “Welcome Aboard!” The last journey is a trek up the long, long gangplank to finally enter the ship. This description of check in takes only a few lines here, but it takes far over an hour to actually accomplish. Long lines are at every stop and the walking distance from ground to ship’s entrance is probably a good mile in length. Once we entered the ship on Deck 3, we needed to get to Deck 12. Naturally everyone else is trying to get to their respective rooms also, so the elevators are four deep in people waiting to board. Another 30 minutes or so is spent trying to climb nine floors. We eventually made it to the Spa Deck, Level 12, Room 12015, and entered our home for the next seven days. The stateroom is practically identical to the one we had on the Triumph last December, which means that it is nice, adequate, and not a square inch to spare. Being on the twelfth level, we had a panoramic view of Galveston, since we are probably 100 feet off the water. But the room is nice. Eventually, we found out that Buddy, Jeannie, Don, and Beth were on Deck 10 in the Lido Restaurant, so we went down to see them. They were nearly finished with their lunches, but we decide to see if we could find some food since it had been a long time since breakfast. Every place was either shutting down to prepare for the evening meal or had not opened at all. We finally found a line to get hamburgers. We waited for 20 minutes and the line closed when we were six feet away from the food….because it was time for the federally required safety drill. We had to go find our emergency assembly area and trek (along with everyone else….i.e. long waits at elevators), to our assigned place. Anyway, the training mercifully ended, and we went back to the hamburger joint and got a couple of hamburgers to tide us over till our 8:15 late dinner. Our relatives had scheduled the late dinner seating, which is not preferred by Shirley and me, but we wanted, of course, to spend quality time with the family, so we went along with it. We hardly ever eat at that late a time. Buddy stayed with us as we downed the hamburgers, and it was good to visit with my old hunting partner. Afterward, Shirley and I headed back to our room to unpack and get settled. We were tired from all the walking and day’s activities, so there was a time of catnapping thrown in that time also. About 8:00 we headed down to Level Three to the Southern Lights Restaurant where, you guessed it, there was a mob waiting to get through the closed doors. But at 8:15 the doors swung open and in a short time we were escorted back to our assigned table…a table for six very nicely located and elegantly decorated. For the next two hours we enjoyed a wonderful dining experience with loved ones and great food. I ate more than I have eaten in the last four months. Very seldom does one feel full when enjoying the Nutrisystem weight loss plan, even though it works very well. I will probably pay for the gluttony tomorrow, but it was very enjoyable tonight. By the time we returned to our room, Shirley and I were very tired, to say the least. After a shower, it was to bed. I guess we were so exhausted for the first couple of hours we didn’t notice the racket coming from next door, but about 1:30 a.m. I awoke and could hear a loud TV and lots of laughing and talking. I tried to ignore it and plugged in my music again, but after about 20 minutes, I called Guest Services to complain and was told our neighbors would be asked to tone it down. I dozed off, but about 2:30 I awoke again to the same noise. This time I call Guest Services and really complained, and that seemed to do the trick…things quieted down. Back to sleep. Monday, April 27 We made it through the night with no other interruptions, thankfully. We were tired and didn’t really start stirring until after 8:00. The ride during the night was really bumpy with a lot of heaving starboard to port to starboard, occasional head on crashes into large waves, and tremendous wind. Traveling faster than the Carnival Triumph at about 23 knots and facing 45-50 mile per hour wind gusts, it was like the ship was bucking a 75 MPH headwind. When the ship hit a large wave it felt like a car hitting an unexpected bump…to the point that the bed jarred, and I thought Shirley was having a nervous jerk. After listening and looking outside the window, it was clear we were in rough seas, and it would not be a smooth ride for a while. I’m sure to the usual seafaring person, it was not cause for alarm, but to more generic landlubbers like us, it was a bit disconcerting. We met the crowd at the same Southern Lights Restaurant as last night and enjoyed a really good, leisurely breakfast. Certainly wasn’t the usual Denny’s Restaurant menu as I had an English muffin with cream cheese and salmon, along with a good omelet with peppers, ham, and cheese…with turkey bacon on the side. Even the coffee was good and the service was great. Afterward, the ladies wanted to go to the Shopping Guide presentation, and Buddy and Don had something in mind, so I went back to the room and started on this dialog. That lasted until the pitching of the boat began to make me feel a little queasy as I stared at the monitor, so I shut it off and lie down to rest my eyes. The next thing I knew, Shirley was calling on the house phone to say they were back in the Level 10 Lido restaurant having lunch. I was still full from overeating last night and breakfast this morning, but I went down anyway and enjoyed an ice cream cone as we visited. Okay…two ice cream cones. By this time, 3:00 was approaching, and Don wanted to go to a Veterans’ get-together in one of the bars, and Buddy wanted to go take a nap. I didn’t have any interest in raising a glass to old comrades, and Shirley was wanting to go visit the spa, so off we went. Our stateroom was on the Level 12 Spa floor, so we were just around the corner from the entrance to the spa facilities. We dressed in our bathing suits, put on the complimentary bath robes and slippers, and made our way. Our first stop after checking our gear in the dressing rooms was the jacuzzi spa, a large heavily-jetted spa for approximately 15-20 people. The most noteworthy item was, due to the pitching of the ship, we also had our own natural wave machine as the water sloshed from side to side to the point that the water was splashing out the ends, and we had to hang on to avoid being swept along in the tide. But it was nice, and the jets were powerful enough to make you feel good to be sitting there. Shirley then wanted to try out some ceramic, heated reclining seats that were supposed to make the back feel good. They were too hard for me, so I visited the Aromatic Steam Room, a wet oven with various pleasing aromas that are theoretically therapeutic for soul and body. Definitely made you sweat, but it felt good. After a refreshing shower, it was back to the room. Looking at the weather and waves outside, it appeared that the swells seemed to be laying down a bit, although we still felt a jolt from time to time. This is the night of the best menu, also, so I dined on lobster and king shrimp. As an appetizer I had a fruit bisque…which sounds strange, but Shanna and Julia had bragged on it after their cruise a couple of weeks ago. It was a sweet cream sort of gravy with strawberries in it. It was good, but I missed not getting my usual shrimp cocktail…should have ordered both. As it turned out, the lobster was okay, but a little rubbery and undone for my tastes, but the vegetables were good. My dessert was cherries jubilee, and again I regretted not ordering my usual melting chocolate cake with ice cream. Actually, the whole dinner was very good; it’s just that on a cruise, one’s standards of quality rises as one expects only the very best in dining pleasure. Tuesday, April 28 Up about 7:30 a.m. as we were expected in Key West port around 9:30. With activities planned, we needed to be through with breakfast and ready to disembark when the gangplank fell. As it turned out, we were not in quite as much of a rush as I expected since the bicycle trip I had decided to join Buddy and Don on was full, so I decided to go with the girls to shop Key West. They in turn decided to not rush down the gangplank, but let the mobs get off first, so I had no reason to hurry. As it turned out, Buddy and Don missed their bicycle trip anyway because they were too late getting to the rendezvous point. They wound up renting individual bikes and taking off on their own. We remaining four disembarked about 11:15 and walked the short distance to the entrance to the main tourist part of downtown Key West. Key West, the southernmost spot in the continental United States, dates back to the early 1800’s and pirate days, though it is more famous now as the primary home to the great writer Earnest Hemmingway, and more recently the hangout for musician Jimmy Buffett and his “Margaritaville” ensemble. The home of Hemmingway and the Margaritaville Bar of Jimmy Buffett are two major tourist attractions in Key West today. We walked the tourist area along Front Street and Duval Street. The area is a conglomeration of high dollar diamond stores, eclectic island offerings, and made-in-Indonesia tourist trap souvenir stands offering $5.00 tee shirts for only $12.95 each or two for $25.00. Intersperse amongst the tourist traps were several beautiful buildings dating from the early 1900s, including the Clinton Square Market Building, the Chamber of Commerce, the Shipwreck Treasures Museum, and several other buildings which I cannot identify. Charmingly little trolley-style cars and mini trains hauled tourist to all the points of interest in orderly fashion, allowing them to spend the maximum amount of money is the minimum about of time. We even saw a sidewalk musician playing his steel drums in the melodic island fashion. Most picturesque. While we were walking in this island paradise, this distinguished gentleman (I assume) walked up to Shirley and asked, “Tell me, Ma’am, were you born beautiful, or did you just grow into it?” Shirley replied, “Huh?” and I replied, “She’s already taken, Bud.” He replied, “I wasn’t hittin’ on her, man;” he laughed, and walked off. Not before making Shirley’s day, though. We did managed to buy a few souvenirs, since we are required by law or something to bring back some sort of trinket for each member of the family (not complaining, I am sometimes the happy recipient.) I was trying to find something authentic…you know…from the earth of Key West, as it were. But beyond the obligatory tee shirt saying “Key West” I couldn’t find much…until I entered a shell shop. There in vast array were some of the most beautiful seashells I had ever seen…even reasonably priced. At one time Key West was apparently know for its conch shells and was even known as the “Conch nation,” and there on the shelf sat these huge conch shells in magnificent shades of colors. I picked one out and took it to the checkout and casually asked whether all these shells on the shelves had come from the sands of Key West. “Nope,” came the reply, “The conch shells came from the Bahamas because in the Florida Keys seashells are forbidden to be collected from the beaches.” So now I have an authentic souvenir from the Bahamas…that I bought in Key West. Oh, well. By this time Shirley and I were beginning to feel the mileage on our legs. Not to mention it was approaching 90 degrees, and it had been a good while since breakfast. We started looking for a place to eat, and apparently in downtown Key West, you’re supposed to shop now and eat later, because there was not too much to be found, unless you went into a bar. We decided to walk back to the Magic and have a late lunch, since it was approaching 3:00 anyway, and we were tired of walking. We were several blocks away from the boat by now so it took a couple of rest stops, but we made it back and reboarded. It was actually a good move, because we beat the returning 3,000 people to the boat AND the restaurant on the boat….we had lunch in the Lido before wandering back to the room. Plus, a rain storm came about 4:30 as the multitudes were in line on the pier trying to get checked back onto the boat. Sometimes the Lord just takes care of the old and helpless. Around 6:00 the rains had abated, and the skies actually looked pretty good as the Magic began to creep away from the dock and aim itself toward Freeport, Bahamas. So anyway, we had a couple of hours to rest before dinner time, and took advantage of it in our stateroom. We left a little early for the Southern Lights, swinging by the gift shops on Level 5, where they had a sale on odds and ands, including Freeport tee shirts, so I bought a couple. At the restaurant, I ordered a flat iron steak with a shrimp cocktail appetizer. Afterward, Shirley and I agreed that so far, the food has been good, but not up to the level of the Carnival Triumph, where every meal we had was astounding. For the first time in many years, I sent a steak back to the chef because it was tough and not done, and the replacement was better cooked, but was not tasty and it was still a little tough. The shrimp cocktail consisted of five really small shrimp that were soggy and not very firm. All in all, not a memorable dining experience. But we were with friends and we had a good visit. Afterward, we all went to the fourth level to see if we could find any of the photos that the constant flock of photographers are constantly taking of you, Shirley and I, and Buddy and Jeannie could find none…only Don and Beth. Buddy and I agreed that it was obvious they were not displaying the photos of the really photogenic people…just the, well, you know. We did not tell Don and Beth of our conclusions. By this time, it was nearly 11:00, and we all said our good nights and retired to our respective staterooms of abode. Wednesday, April 29 Awoke to heavy clouds and rain as we crept into the harbor at Freeport, Bahamas. Shortly, the announcement came over the speakers that most of the tours had been cancelled for the day. Although our Freeport Island Tour was not one of the cancelled tours, we decided that we didn’t want to get wet walking to the bus and would try to get our money back. We went to breakfast at the Lido Restaurant on Level 10 and sort of took our time over a leisurely cup of coffee. As we were doing so, the skies seems to clear a bit and the rain stopped, so we decided to go ashore anyway and check out the group of shops that were just off the gangplank on land. In doing so, we realized that our tour was just loading, and the weather seemed to be improving, so we got in line to load up. When I was asked for our tickets, I realized I had brought the wrong tickets…I had brought the ones for our tour tomorrow at Nassau. The lady was very helpful, however, and issued us replacement passes on the spot, and we were able to board. The Freeport Island Tour promotes the idea of exploring the island of Freeport. What you see is not too much. Never saw a beach. We wandered through wealthy neighborhoods and blighted ones and saw the magistrate house (courthouse) and various schools and churches. Especially churches…our driver was a devout Baptist, and he proudly pointed out his church as we passed. He was friendly and helpful, actually…he just didn’t have much to work with. The area around Freeport is the industrial area of the Bahamas, apparently, with oil tanks, a major container shipping shipyard, a marine drydock for even the large passenger cruise ships, and various other smaller manufacturing and shipping facilities. Blue collar type of work. As a result, most of the area is blue collar area with signs of wear and tear…not touristy, camera-ready scenery one would normally want to preserve for posterity. The whole idea of the tour, anyway, was to get us to the Port Lucaya Marketplace, the “quaint” (tourist trap) area where one can buy “authentic” Bahaman crafts and souvenirs…not to mention “world-class” jewelry and diamonds. It’s a mixture of high-dollar jewelry stores and eclectic hole-in-the-wall shops with the natives beckoning you to “come look, Sweetie, at these great bargains!” It was there I found more conch shells like the one I bought in Key West. Beautiful shells…I paid $15.95 for the one in Key West and thought it was a bargain compared to such items in the Houston area. Here, I found two places that were knee deep in beautiful conch shells….at $2.00 each! Oh, well, it was a cheap lesson to learn: to get the best deal, always go straight to the source of the product. We spent a couple of hours at the marketplace buying a few items. Actually we ran out of money…primarily because all the merchants we bought from were cash only, and we did not bring much cash with us, thinking we would not need much. Probably saved us some more unwise purchases. We made our way back to the ship…past the homes of Sidney Portier and the late Count Basie (“and his Band of Renown”) and various homes of rich eccentrics such as the guy who had hundred of statues of lions on his wall fence and in his yard…past the oil tanks that reminded us of Baytown Exxon and the shipyard with hundreds…maybe thousands…of shipping containers, and finally the drydock with the huge cruise ship perched up on scaffolding as workers welded and did whatever else to the hull. We reboarded around 2:00 and after a stop at our stateroom, went back to the Lido for a bit of lunch. Naturally, I picked up more food in the buffet than I could eat. I am afraid that I will suffer a bit of a relapse on my Nutrisystem diet plan after this week, but I planned for it, so it will be simply back to the regimented eating schedule once we get home. But for this week, I am going to enjoy some good food. We were due to set sail for Nassau about 5:30, but apparently they had spotted a squall in our path and delayed our departure until 7:00 p.m. Lines were cast off, engines were revved up, and we pulled away from the harbor about dusk for what turned out to be a very smooth ride to our next destination. 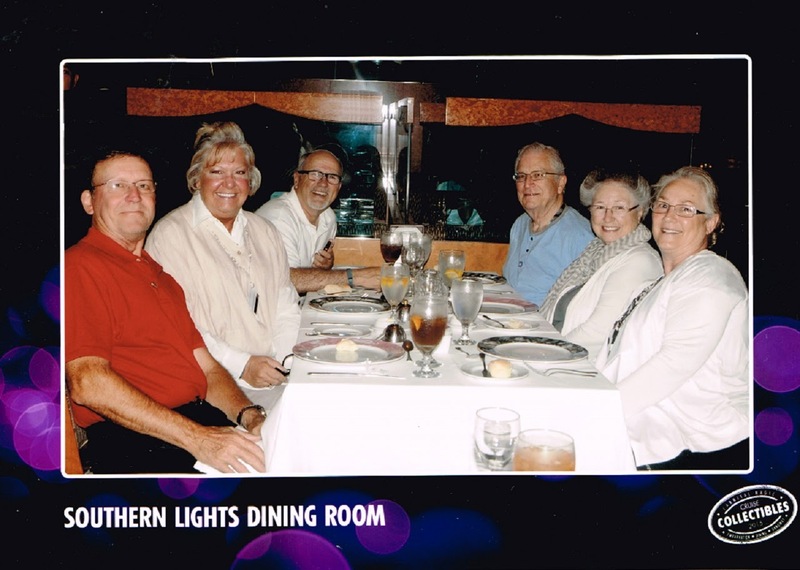 In the meantime, the group of six met at our usual spot at table 573 in Southern Lights Restaurant, having been met by our personal waiter who greeted us all by name, placed our napkins in our laps, and brought us some fresh bread and butter. I could get used to this. Tonight I ordered a turkey and butterfly pasta dish with vegetables that was very tasty, along with a appetizer of roast duck and oranges. My dessert was sort of like the hot melting cake we all love, but rather with sort of an apple cake filling. Quite good. At this time Jeannie said she had located our photos we were looking for last night, but most of us were worn out from the day’s activities, and, since it was approaching 10:00 p.m. anyway, we said our good nights and went to our cabins. It’s a rough life on the high seas….sleeping…eating…touring…walking. Balmoral Island is a private island a couple of miles out of the harbor that has been developed into a mini luxury beach resort that is one of the Sandals destinations. Featuring lots of sand, a protected beach, opportunities to swim with dolphins and stingrays, and even a mini Starbucks and restaurant, it is a rather nice getaway from the maddening crowd. Even with our boatload of people, there were plenty of room to roam, chaise lounges with umbrellas, clean restrooms, and nice water. However, although we had been told to “bring our bathing suits and towels,” there were no dressing rooms, just bathrooms with no lockers or places to stash valuables. Fortunately, Shirley and I have learned to travel light in affairs like this, and I carried a waterproof pouch for cards and money, and we left everything else of value in our safe in our stateroom. The second problem was our tour began at 7:30 and it was 8:45 before we were able to stick our feet in the water. And the first toe in the water was a bit of a jolt…it was chilly. It reminded me of Hawaiian water…and the best way to get in the water is…get in the water fast. I waded out a short distance, but then turned and just fell backward. Once you caught your breath it wasn’t too bad. The chilly effect of the cool water was compounded by a strong breeze, cloudy overcast skies, and moderate temperatures. In fact, the day had been predicted to be rainy, but so far the rains had abated, and other than a little cool and windy, wasn’t too bad. But it did put a bit of a crimp on the swimming. In fact, Shirley never got in the water. The cool breeze was enough to dampen her enthusiasm for getting in the water. It was a chance to try out Bobby’s GoPro III digital underwater camera he had lent me for the trip. I wandered out further and fired up the GoPro, taking stills and movies both above and below the water line. Only downside to the GoPro is there is no monitoring screen, so you take the photos by faith, hoping you’re aiming in the right direction. I had taken a few practice shots earlier, and tried to download them to my Sony VAIO laptop, but, alas, my laptop is celebrating its fifteenth year and would not recognize the GoPro…plus it probably didn’t have the memory capacity to store HD movies anyway. So I will have to wait till we get home to seem if my underwater selfie turned out OK. So I swam and videoed while Shirley read her latest book, with intermittent rest periods on the lounges. Really a pretty nice time. About an hour before we were to head back to the Magic, we decided to have a little brunch, since we missed breakfast, and besides, our tour tickets for this beach trip included lunch. So up the beach to the Starbucks/restaurant we went and ordered. The chicken wrap Shirley ordered and the grilled chicken sandwich I ordered were tasty and huge and included French fries. They should have been tasty and huge since Shirley’s sandwich cost $13.00 and mine $16.00…but at least they were included in our tickets. We dined and rested while we waited for time to board. About 11:15 we boarded for passage back to the Magic, and that was when I noticed the pens where the stingrays and dolphins were kept. This place advertises “Swim with the Dolphins” and Swim with the Stingrays.” The way Bobby and Shanna described it in Cozumel was that the stingrays and dolphins were actually wild creatures which you were privileged to swim with. These poor creatures, however, were kept in what I estimate to be three to four acre pens at ocean’s edge. The areas were heavily fenced all the way around so that the sea-loving prisoners could not get out. It was sort of a water zoo. I felt sorry for the stingrays and dolphins. I will admit one dolphin seemed happy as it constantly jumped out of the water doing its acrobatics to the delight of the swimmers. Anyway, I was pleased that we would not be riding back in the boat we came in. The return cruise was done without the cheerleading of the first trip. However, for some reason, we were unloaded way around the docks from the Magic gangplank, and the walk back was probably over three fourths of a mile. I gauge that from the fact that we were about four Magic boat lengths away from the gangplank…and the Magic is 1,000 feet long. Shirley was really dragging, and I was feeling the effects of the long walk also as we plodded step after step….and then the rains came. As we were heading toward the Magic, a new flock of private beach goers were heading to the tour boat to the island. I had noticed that the skies had been darkening for the last hour or so, and, sure enough, about halfway through our walking journey back to the boat it began to rain…really rain. One of the city cab drivers said, “Bahama liquid sunshine, man!” and laughed. We made it to a covering and waited for a few minutes until it abated a little, and then we put our bath towels over our heads and finished the trip. By the time we made it to the gangplank, the rains had faded. There we met Buddy and Don as they were headed back to the tourist shopping areas to nose around since they had finished their kayaking adventure earlier. We did not feel like going back to shop and continued to our stateroom. Once in room 12015, we collapsed. Overall, though, it was a fun trip. We rested for an hour or so, then decided to visit the Spa area and sit in the Jacuzzi to massage our weary bones a bit. Enjoyed the powerful Jacuzzi, where you had to hang on to keep from being treated like a teabag in boiling water…then to the sauna for Shirley to toast on the heated, molded, ceramic seats. I went to the aromatic steam room for about fifteen minutes, then to the sauna in the men’s dressing room. Or I tried. As I opened the door to the men’s dressing room, there was a woman inside the door who said “Excuse me” and closed the door on me. I noticed next to her leg was a walking cart, so I assumed she was perhaps helping some handicapped gentleman get ready for some exercise. I stood outside the door and patiently waited. About four minutes later, just as a spa attendant was walking by the door, the lady came out of the room pushing the cart and asked the attendant, “Excuse me, where’s the ladies’ dressing room?” “Next door on the left,” he told her, and she pushed off, looking a little embarrassed. If she looked inside the sauna in the men’s locker room, she got the shock of her life. Anyway, I cooked to medium well in the sauna, showered, and went back to our room. A few minutes later Shirley entered, and we decided to go find a little snack, since our dining time is 8:15. At 5:00 on the boat, most of the buffets and snack places are closed, still getting ready for the evening meal, but we went to the stern of the boat and found a deli offering sandwiches, and enjoyed (for her) a tuna fish sandwich and (for myself) a ruben sandwich. Returning to our room, we swung by the photo gallery where we found some of our photos from the last couple of nights. They will print them and we’ll see if we want copies sometime tomorrow. Came back to the room and were surprised to look out our window and realize we were slipping our of the Nassau harbor. The startup had been so smooth it was not even noticeable. We now have a 62 hour cruise back to Galveston. At 8:15 we parked ourselves at our usual table for an evening of fine dining. I enjoyed a filet mignon with a small serving of short ribs…which I think must have been the same as roast beef…along with roasted potatoes and vegetables. Tonight I reverted back to my favorite desert, the hot melting chocolate cake with vanilla ice cream. What makes each of these dining experiences even more enjoyable is our waiter continues to bring us various forms of bread…wheat, white, rolls, French…until we finally just say, “No more, thank you.” Our drinks are always bottomless…the wait staff never allows your drink glass to become empty, and are always pleasant and engaging. The service is just nearly impeccable. It’s nice to be treated like royalty for once in one’s life. My in-laws were at their entertaining best, and the whole evening was thoroughly enjoyable. Afterward, there was a play or musical or something at one of the theaters which everyone (but me) wanted to go to, so I blessed them and sent them on their way while I retired to our cabin. Finished the day with a little writing and then packed it in for the night. Friday, May 1 Since we are now at sea on our return voyage, there was no reason to set an alarm clock this morning, so we were able to wonderfully sleep until we woke up. It’s wasn’t really late…only around 8:00 a.m. Which reminds me of an interesting tidbit I learned yesterday. We had wondered about the times posted at each port as far as how we would know what time zone we were in, but as it turns out, the boat is always on Houston time…the clocks do not change for the various time zones the boat travels through. So when port arrivals and departures, tour starts and returns, etc., are posted it’s always Houston time. The result is one never has to worry about changing watch settings or worrying about a time change. Handy. Whatever time it was, we awoke to a beautiful, sunny morning…the first we have seen on this cruise. But it was also a little chilly on the high seas; the clearing weather front had moved through the areas last night, pushing away the rain and clouds, but also dropping the temperatures. It was a little bit too chilly to be sitting on our deck this morning, but the clear skies and sunshine were welcomed anyway. Considering the weather we’ve had these last three days, we were fortunate to get our tours in without interruption…in all three locations, Key West, Freeport, and Nassau, there were tours cancelled, but we were able to enjoy all of ours. Since we didn’t have to rush for breakfast, we went back to my favorite place for breakfast, the Southern Lights. Impeccable service, just like in the evenings but with a superb breakfast. I had chocolate chip pancakes for an appetizer(!) with an omelet featuring peppers, onions, ham, and cheddar cheese with a side of hash browns. Interspersed through the breakfast were the usual bread goodies: rolls, muffins, cakes, toast, etc., along with a bottomless cup of good coffee. It is going to be a real downer to come back to earth nest week and go back to an eating regiment. By the time breakfast was over, it was nearing 11:30, and we wandered back to our rooms for a few minutes and then regathered on the Lido level (Level 10), found a table, and played cards until nearly 2:00. Suddenly someone realized that Bingo started at 2:15, and the consensus was this was the best way to recapture some of our frivolously wasted money…by winning at bingo. So down to the Showtime Theater on Level 3 we went to get there in time to buy…excuse me…invest in some bingo cards to the tune of $30.00 for each of us. Well, you have to invest money to make money. There were three rounds of bingo with prizes from about $500 up to $750. On the first round, tension mounted as Shirley was within one number of winning when some other person yelled, “Bingo!” to her dismay. No problem…we have two more games to go. The second session…well…we were not even close, but there’s always the last round with its biggest prize. My heart beat began to rise as I inched closer to the prize and was one number away from winning. All I needed was B-12, and I would have victory in my grasp and be financially solvent again. Alas, the number called was B-13, and some other undeserving soul yelled the dreaded word, “Bingo!,” and my hopes were dashed. Oh, well, one has to look at bingo sort of like playing the stock market…you invest, and sometimes you win, and sometimes you lose. With a sense of loss and dejection we exited the theater…older but wiser. It was approaching 4:00 and the girls wanted to go up on deck to sit in the sun and read, while we guys decided to go to our respective homes of abode and catch a nap, so the next hour or so was spent recharging batteries. Back to the Southern Lights tonight for the best supper so far. I had escargot and a seafood sampler as appetizers. The escargot was out of the shell in butter sauce; they were tasty, but not quite garlicky enough for me…but good, nonetheless. The seafood sampler was just that…a sampler: one shrimp, a bit of salmon, and a scallop with a bit of sauce. In honor of New Zealand and in memory of the Moreaus I had a glass of New Zealand white wine to complement the seafood. Very mellow with a good presence to use wine tasters’ lingo. The main dish was chateaubriand beef, with potatoes and vegetables. The beef was wondrous, perfectly cooked and very tasty, and, of course, the various forms of bread and the bottomless glasses of tea were ever-present. These are magical moments spent with good food and good family that one will remember for a long time. Buddy and Don are great guys, Beth is funny without trying to be, and Jeannie is always her charming, irreverent self (I say these thing truly lovingly.) I wish B and J lived closer to the rest of us, but their kids are anchored to Colorado/Wyoming, and I understand there is no greater pull than that of your children. I mean, after all…Shirley and I are in Texas, aren’t we? And it’s not because we loved Baytown. Anyway, the dinner party didn’t break up until about 10:20, so we headed back to our stateroom for the night. I walked out on our balcony to check the weather, and it was cool with relatively calm seas, but we have still yet to see a star in the sky during this whole trip. Though it was calm, apparently there was still an overcast of clouds and it was dark as pitch. At least it was not raining. Lights out. Saturday, May 2 Our last full day at sea began at 8:30…relatively late for us. I tried to call the other folks but could not figure out where they were, so about 9:45 we headed to the Lido for breakfast, where we ran into Jeannie in a food line. We loaded up with breakfast, got a open seat by a window, and enjoyed a leisure (what else?) breakfast. Eventually Buddy showed up, and we discussed major events of the day like when do we eat next and what’s next on the schedule. There was a watch sale on Deck 5, and, though I have twenty or so watches at home, I felt I needed to get a couple more if I could find something I liked. On Deck Five there was a mob around the watches…there were two long counters full of watches…all priced at $19.95 or $29.95 (so you know they were very high quality watches!) This was the only day on ship to get a reasonably priced watch. All the other days they were selling quality watches for 75% off…which meant you could buy one for as low as $300.00; or you could get a Rolex for as low as $3,995.00. Although the temptation to buy a Rolex was great, I decided I’d rather pay my bills next month, instead, so I passed on the fantastic bargains. Shirley and Jeannie decided to go up to Level 11 for some sunshine, but I opted to return to the stateroom. After a while, Don called to say they were in the Lido about to have lunch, so I went down to join them. I wasn’t hungry, yet, so I picked up an ice cream cone along the way and met them in the Lido dining room. Eventually, Buddy, Jeannie, and Shirley came in and we sat and visited for over an hour. Buddy and Don were wanting to try their hands at traversing the overhead rope course in Deck 11, so we all went up a level and watched as the two guys, using safety harnesses, tight roped themselves around the obstacle course. Nobody fell or slipped, so there were no anxious moments…except when Don teed off on the putt-putt golf course, and his ball left the course and nearly hit a guy sitting at a table. No harm done, though, and all went well thereafter. We sat in the sun and began to feel the heat thereof, until I finally got up to take a few videos, and the girls left to find a shady spot to read and crochet….yes…crochet. I came back to the cabin and started to get semi-organized for tomorrow’s sad debarkation from the ship. By the time the dinner bell was about to ring, we were pretty well packed up and ready to move out tomorrow. Since we were using the “relaxed exit” tomorrow, which means we were going to let the porters haul our luggage down 9 levels of decks to the debarkation area, we had to have our luggage sitting outside our door by 8:00 p.m. tonight. So as we were heading down to the Southern Lights for one last hurrah, we sat our luggage outside and hoped it all stayed together. The last supper (as it were) on board a cruise ship is always sort of melancholy and wistful, as everyone wonders where the week has gone and do you suppose there’s some place we could stowaway on board for the next cruise? Alas, there is no place to stow away, so we prepared for the inevitable descending back into the real world. Tonight was prime rib night with baked potatoes, along with two appetizers, shrimp and vegetable rolls, topped off naturally by the fantastic hot melting chocolate cake with ice cream. Definitely the Carnival’s signature dessert. The wait staff serenaded us as is done on every final night with “Well, I’m Leavin’ on a Fun Ship….,” a takeoff on the song “Leaving on a Jet Plane.” Sort of sadly fun, and they actually sing like they are sad to see us leave…they probably can’t wait to get a break. Actually, there isn’t much of a break for them. We disembark tomorrow morning and by noon a new hoard of excited travelers will be invading the ship. Our last official act in the dining room was pass out the tips for our personal waiters. One of the major expenses of sailing, I have found out, is the cost of tipping. Each person is automatically charged $12.00 per day while on board…so for two people, that’s $168 for the week, plus one is expected (well, naturally) to additionally tip for “exceptional service,” which at $5.00 to $20.00 per pop (porters…luggage, waiters, stewards) can add up to an additional $100-$200 per week. Oh, well, the service is usually impeccable and friendly…most of the tipping is worth it. After wandering a bit after dinner, we settled back in our stateroom for our final evening. At least by now, the skies had cleared, there was a beautiful moon, and the seas were calm; it was a smooth ride back to Galveston. Sunday, May 3 We looked out the balcony window just in time to see us backing slowly into our berth at the Galveston dock from whence we had left. Apparently once the Magic enters Galveston harbor it is spun around and backed into port by tugs. It’s so slow, however, that unless one is outside on the deck, it is not even noticeable. We had to vacate our stateroom by 8:30, so we went down to the Lido, Level 10, for breakfast. We enjoyed one last breakfast in the Lido Buffet and awaited our turn to disembark. Your luggage tags have zone numbers assigned, and debarkation is scheduled by zone number. We were zone 6, so it wasn’t but a short time until our number was called, and we began the long trek to our car. First it was down to deck three, where we were checked off the boat, and then we walked the long zigzagging gang plank down to the dock level. The dock level is actually the second level of the customs building, so once we got into the customs area we had to go down another level to go through customs. Here’s where we had a stroke of luck. As we were walking by, one of the female customs attendants apparently saw Shirley was moving a little slow and directed us to a side elevator, where we were able to glide down to the main level. Then, as we left the elevator, another attendant asked, “Would you like a porter to get your luggage?” “Yes!” we gasped. She waved this guy over and he asked us what zone our luggage was it, and then said, “Come on, we’ll cut through these lines.” He pushed us through probably 500 people, got our luggage, and then took us to a side line for customs check that bypassed another mob of people. Once we cleared customs, he carried our luggage out to the bus and loaded it for us. That was the best $20.00 tip I ever spent. Once on the bus, we were taken back to our car, where we unlocked, loaded up, and headed for home. At 1:00 p.m., one week and one hour after we left home, we drove back into our driveway. It was a wonderful week. Whether we ever go back to the Bahamas is debatable. Freeport is more of a blue-collar, industrial area, sort of like Progresso, Yucatan, but with no colorful history to make it interesting. We really can’t make a judgment about Nassau, since we spent all our time at a private island, which was very nice, but we didn’t get to see much of the history and color of Nassau. I saw one policeman or official wearing a pith helmet and a white uniform, but that was the extent of the English influence we saw. I suspect there is much more to see and do in Nassau…even if the U.S. officials have warned tourists to be vigilant due to the rising crime in there. Where do we go next? Stay tuned.